Asian greens are easy to grow, delicious, and healthy. They are cool-season plants and among the earliest vegetables you can start and harvest. 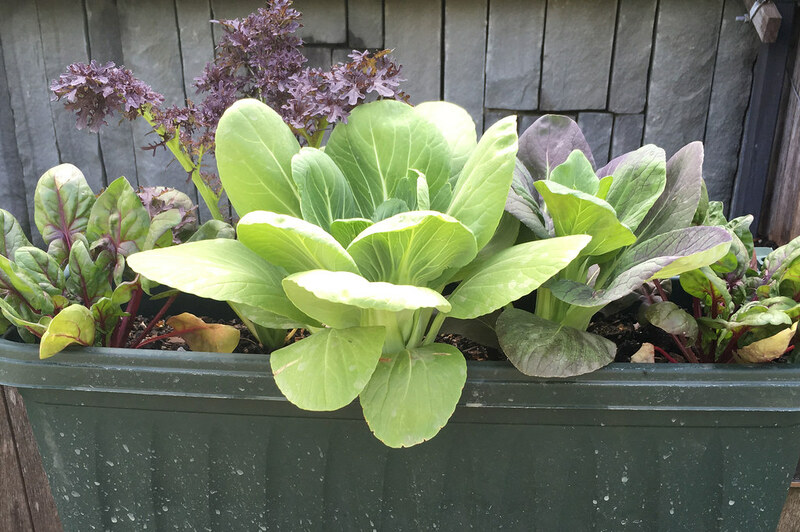 These lovely leafies can be started as early as St. Patrick's Day in a raised bed, large container, or even a large window box, and they’re tasty raw when young or cooked when mature. They don’t tolerate summer heat well, yet they can be planted again in fall. Mizuna, tatsoi, pak choi, and komatsuna are members of the mustard family (Brassicaceae), and they are all widely used as cooking and salad greens in Asia. They have a flavorful zing, and like their siblings cabbage and broccoli, they are vitamin- and nutrient-packed superfoods (see below). 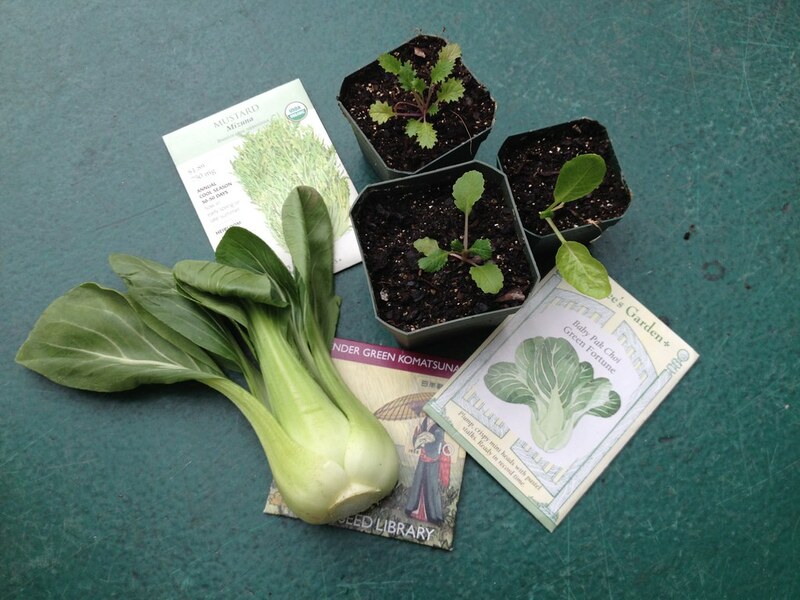 All four of these greens can be easily grown from seed and do well in containers. The leaves offer texture, structure, and beauty to spring borders and edges. Mizuna has spiky pale green leaves; tatsoi grows in spoon-shaped rosettes; pak choi has curvaceous white-ribbed jade leaves; and komatsuna produces upright emerald leaves. There are many different cultivars of each. Start the seeds indoors and transplant them, or plant them directly in garden beds as soon as the soil can be worked, usually around mid-March. In general, these greens prefer full sun, but they can tolerate light shade. Follow seed packet directions for the particular spacing requirements for your selections. Plant your seeds outdoors in good garden soil enriched with half an inch of compost or in potting soil in a container. Ideally, feed with diluted compost tea or fish emulsion every two weeks to produce nice, full plants. The greens can be harvested at any stage. Most plantings will need to be thinned after the seedlings have two sets of true leaves. Use the thinnings as garnish for open-face grilled cheese sandwiches. Within three weeks or so, you'll have baby greens, which can be snipped or picked. These make a zesty salad when lightly dressed with apple cider vinegar and a few drops of toasted sesame oil. About three weeks later, you can pluck full-size heads to use in a healthy stir-fry, in veggie chili, or in the tasty recipe below. Seeds for Asian greens are sold at BBG's Gift Shop and can be ordered online from Renee’s Garden, Hudson Valley Seed Library, High Mowing Organic Seeds, and Kitazawa Seed Company (which also offers recipes). 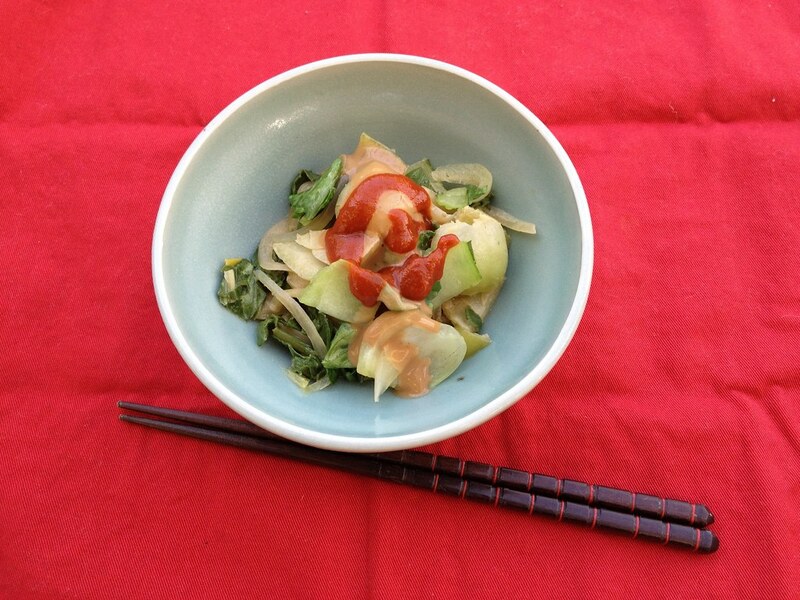 In Japan, greens are often served with sesame seed dressing. A traditional dish offered in some restaurants is horenso no goma-ae, or spinach with sesame seed dressing. I’ve adapted a version of this classic for my family using ingredients that we usually have in our Brooklyn pantry. Like other members of the mustard family, Asian greens have a spicy kick. This is tamed by the rich flavor and dash of sweetness in the dressing. Clean and chop the greens into half-inch pieces, keeping the stems separate. In a cast iron skillet or heavy 3-quart saucepan, sauté the onion and garlic in oil on medium heat until wilted but not browned. Add the stems and cook 2 to 3 minutes, stirring as needed to prevent scorching. Add the greens and cook 1 minute. Turn off the heat and cover the pan. Rest 5 minutes, then carefully drain off any pot liquor and reserve. While the greens are resting, measure the peanut butter in a small bowl and mix in the remaining ingredients one at a time, adding pot liquor, broth, or water as needed to make a creamy, smooth sauce. Toss the finished dressing with the greens, adjust the seasonings, and serve. How Healthy Are Asian Greens? Pak choi is full of fiber, vitamins C and E, and sulforaphane, which wards off cancer. Komatsuna is packed with lutein, which may protect against cataracts; calcium for strong bones; and potassium, important for good organ function. Mizuna contains vitamin C, iron, and glucosinolates—antioxidants that help reduce cancer risk. Tatsoi contains vitamin A, folate, and the very important vitamin K, needed for blood clotting. Easy-to-grow greens. Photo by Maureen O’Brien. Pak choy (Brassica rapa var. chinensis) and other greens can easily be grown in a window box. Photo by Sarah Schmidt.